Close to lifts & slopes allowing you to ski back to the chalet! Lovely self-catered Apartments with fantastic views. 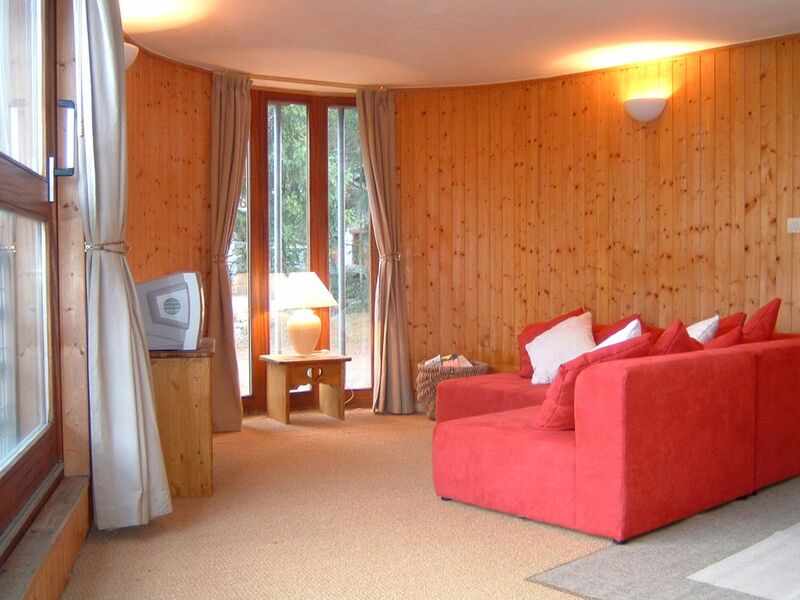 APARTMENT 1 at Chalet Leslie is situated on the ground of the chalet and sleeps 4/6. The apartment has great facilities and direct access to the terraced garden with elevated deck area. The layout comprises of; a shower room and toilet, double bedroom, bunkroom and spacious main room with kitchen/diner, seating area and a separate double bed sofa. • Ski and bike storage. My wife and I have owned Chalet Leslie for 14 years. We live in the UK now so rent out the apartments within the chalet during the summer and winter seasons when we are not holidaying there. It's in a great location with fantastic views. The slopes and lifts are located really close, a stone's throw from the chalet. The apartment kitchen is ideal for self-catering with a fridge/freezer, microwave, a 4 ring hob a toaster and kettle. The dining area has adequate seating for 6 people. Perfect location for the slopes. We were able to ski down to the town so no need for bus transfers. Listing and pictures were accurate. Communication was outstanding with the owner, who provided thorough information via email and was very responsive to questions and queries we had. The property had everything we needed and it was great to have our own area for skis and a separate boot room. Would highly recommend. Stayed at chalet lesley first week of January, Fab location, bout 5 min walk to the pleney lifts and Morzine. Glen the owner of the chalet is very good with communication. He sends information on ski hire etc and a map of the immediate area pointing out shops etc.would definately recommend! Fantastic chalet in a great location just on the edge of town. Spacious living area, well equipped kitchen and lovely outside area for BBQs. We just used our bikes to get everywhere from the Chalet. Morzine itself is perfect for the active family in summer. Stayed in this top floor apartment which had great views of the valley. We are a family of 3, there was plenty of space, with the use of our own drying room downstairs for ski gear too! Apartment is clean, tidy, with a well equipped kitchen, and conveniently located for shops and restaurants. Great location, clean and lovely and warm to come home to after a day on the slopes. Glenn is always happy to help. Great apartments in a good location!! Found the apartments fine using postcode and keys left for us in key safes outside, the apartments were clean and tidy and everything was there that we expected, the apartments were bigger than I expected from the pictures!! bus stop is 2 mins down the road and nearest lift is about a 5 min walk from the apartments, would definitely recommend and am planning to return to chalet Leslie if we go back to morzine!! Chalet Leslie offers very easy access to unlimited skiing to both experts and beginners using the Pleney Lifts & Slopes located at the rear of the property. During the summer Morzine is ideally for mountain bikers, hikers, golfers and families. The outside swimming pools are just a short walk from the chalet, with many swimming lakes close by. Other Activities: Multi-Pass Chalet! 2€ per day for use of summer facilities!!! Golf: There are 18 hole golf courses at Les Gets (10 mins), Evian (35 mins) and Chamonix (60 mins) with a 9 hole course at Avoriaz (20 mins).